The press release, states “The combined company will be named DowDuPont. 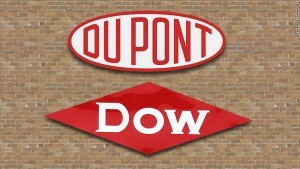 The parties intend to subsequently pursue a separation of DowDuPont into three independent, publicly traded companies through tax-free spin-offs. This would occur as soon as feasible, which is expected to be 18-24 months following the closing of the merger, subject to regulatory and board approval.” The merger could revive attempts at consolidation between other big companies in the agrochemical industry. Agriculture Company: “Leading global pure-play agriculture company that unites DuPont’s and Dow’s seed and crop protection businesses.” Revenue: $19 billion. Material Science Company: “A pure-play industrial leader, consisting of DuPont’s Performance Materials segment, as well as Dow’s Performance Plastics, Performance Materials and Chemicals, Infrastructure Solutions, and Consumer Solutions … operating segments.” Revenue: $51 billion. Specialty Products Company: “The businesses will include DuPont’s Nutrition & Health, Industrial Biosciences, Safety & Protection and Electronics & Communications, as well as the Dow Electronic Materials business.” Revenue: $13 billion. Reuters, in its analysis of the merger, stated that, “The merger puts further pressure on rivals such as Germany’s BASF SE and Bayer AG to consolidate as falling crop prices curb sales. It could also prompt a renewed flurry of takeover bids for European rivals, with Syngenta AG the most likely target. Analysts have said a Dow-DuPont tie-up might push Monsanto Company to take another shot at Syngenta after the U.S. company abandoned a $45 billion offer for the Swiss company in August.” Many of these big agricultural companies have been struggling to cope with falling demand for farm chemicals due to falling crop prices and a strong dollar, and may believe that a merger will provide longer-term security. However, for the billion-dollar agrochemical industry, a merger is likely to only provide short-term stability, increase the wealth of top executives, and raise the cost of food, as the new corporation will create a near monopoly that will allow it to increase prices. In the long-term, the market will reveal that relying on the promotion of chemical-intensive agricultural practices is not a sustainable business practice. Chemical-intensive (or conventional) agriculture depends on chemical fertilizers and toxic pesticides that have been shown to reduce soil organic matter and decrease the diversity of soil biota. These chemical inputs contaminate waterways leading to eutrophication and “dead zones,” where nothing is able to live or grow. Eventually, as chemical intensive agriculture depletes organic matter in the soil and there is nothing left with which to grow food or sustain life, chemical inputs will become obsolete. Sustainability advocates say that the only way that the agricultural industry can create a sustainable business model is to produce products that are compatible with organic agriculture. While some argue that organic is too expensive, the simple fact is that chemical companies are able to externalize the social cost of their products in the form of eutrophication, soil erosion, harm to wildlife, healthcare costs to consumers, and numerous other adverse effects. Some researchers calculate the adverse impacts to health and the environment to be as much as $16.9 billion a year. (Tegtmeier and Duffy 2004) If consumers paid the true cost of conventional food production, prices for conventionally grown goods would certainly be more expensive than organic products, which are certified through a process that protects human health and the environment. Good organic practices work to build the soil and maintain an ecological balance that makes chemical fertilizers and synthetic pesticides obsolete. Claims that organic agriculture cannot feed the world because of lower yields are contested by scientific studies showing that organic yields are comparable to conventional yields and require significantly lower inputs. Organic agriculture advocates say that it is not only necessary in order to eliminate the use of toxic chemicals, but to ensure the long-term sustainability of food production. This entry was posted on Monday, December 14th, 2015 at 12:00 am	and is filed under Uncategorized. You can follow any responses to this entry through the RSS 2.0 feed. You can skip to the end and leave a response. Pinging is currently not allowed.